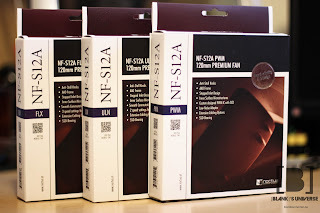 Noctua graciously sent us 3 of their new NF-S12A fans for review. 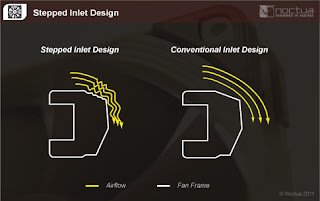 These are their 3rd generation fans from the S12 lineup which feature new improvements that provide a 8% increase in airflow and noise efficiency compared to its predecessors. There are 3 models: ULN, FLX, and PWM, each offering its own settings for speed and silence. 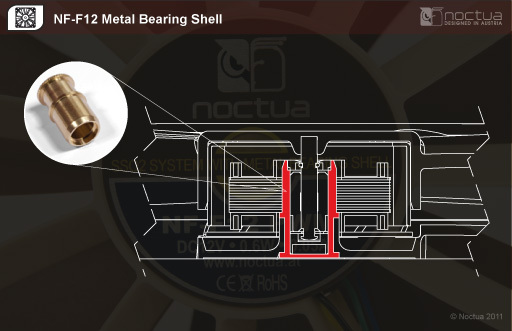 Noctua's S12 lineup has received more than 250 awards and recommendations since they were first released. 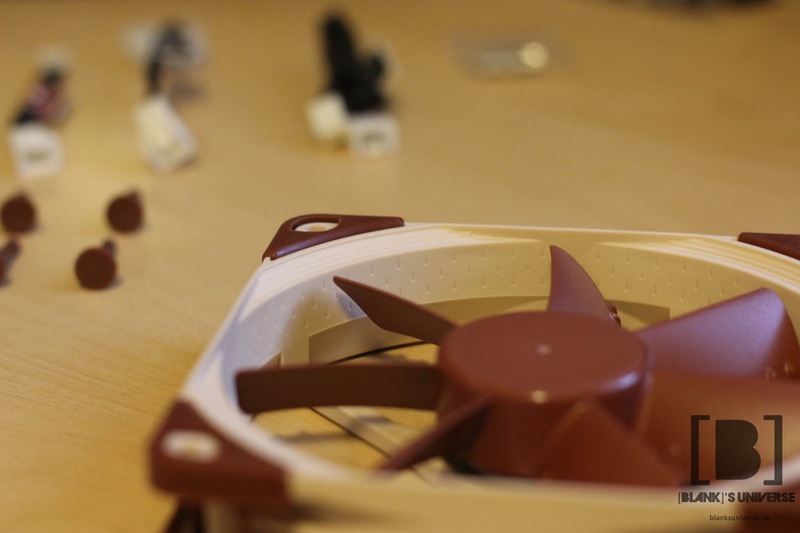 Noctua differentiates themselves from other companies by incorporating new technology rarely seen on other fans to maximize airflow, while maintaining low noise. 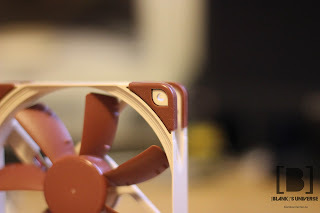 The fans have a beige frame with a brown fan. This colour scheme is said to be neutral and can be matched with any colour scheme. 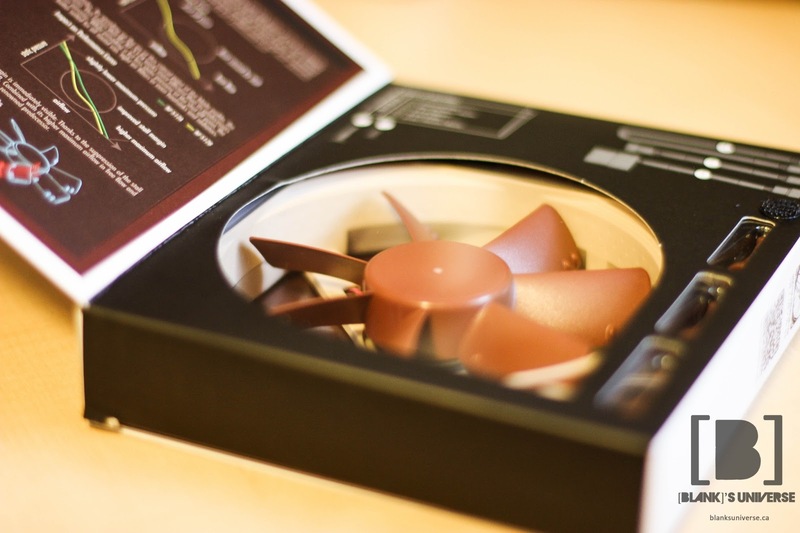 The fans come in the standard white/brown Noctua packaging with a window behind the front flap to see the fan inside, as well as a lot of information about the technology they put into this fan behind the rear flap. The fans include 4 rubber fan mounts to help isolate the noise caused from vibrations by preventing them from being transferred to the computer case. They also include 4 standard metal screws in case the user needs them. 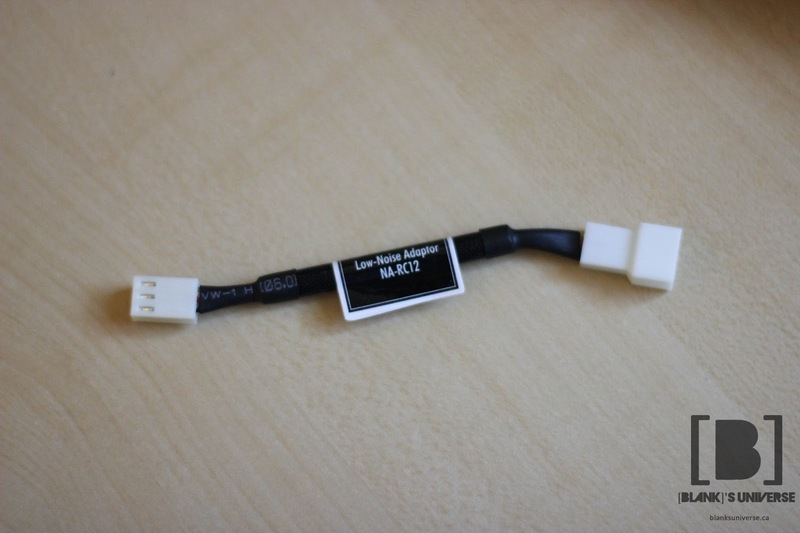 The ULN and FLX models include a 3-pin to 4-pin molex adapter in case the motherboard does not have enough fan headers. 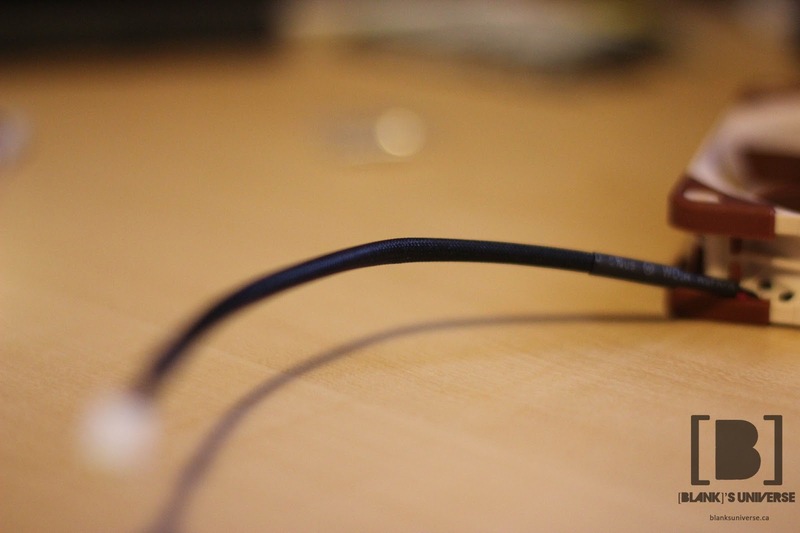 All three models include a low-noise adapter to reduce the fan speeds as well a fan extension cable while the FLX includes an additional ultra low noise adapter. The PWM model includes a dual 4-pin to single 4-pin fan splitter as well. 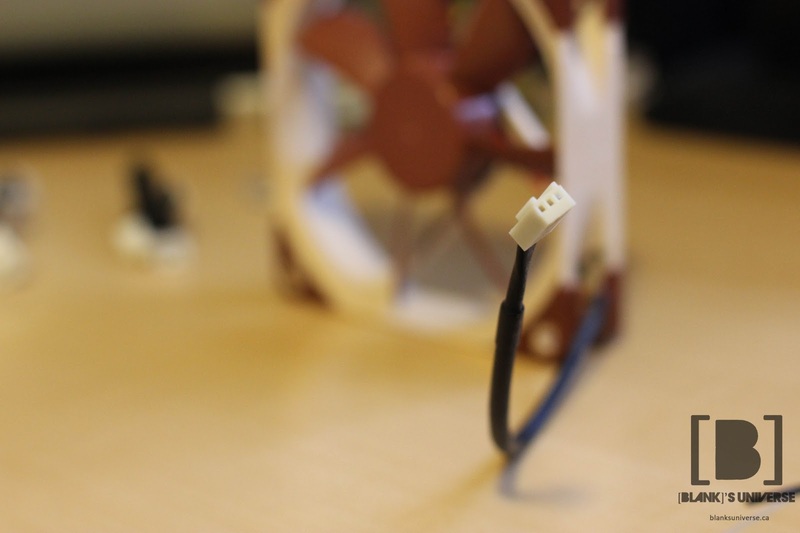 All of Noctua's adapters have the same cable sleeving found on the fans and are very good quality. 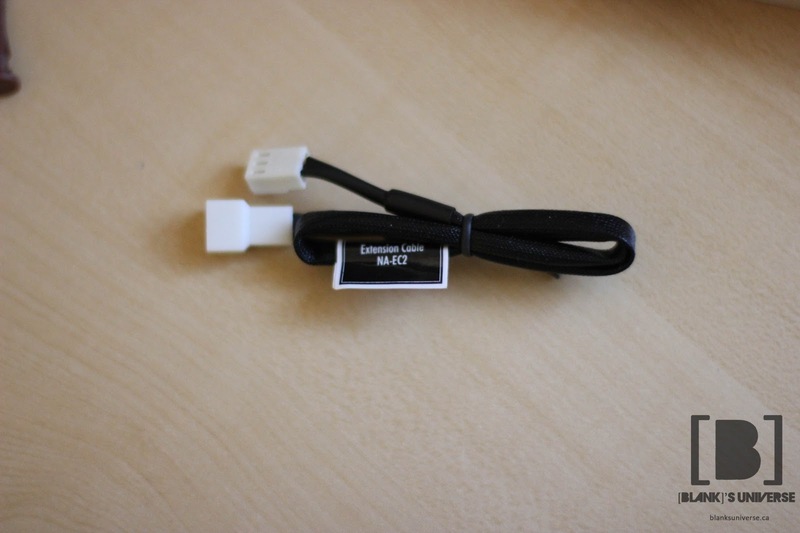 The cable sleeving is a tight woven plastic and none of the cables are visible through the sleeving. 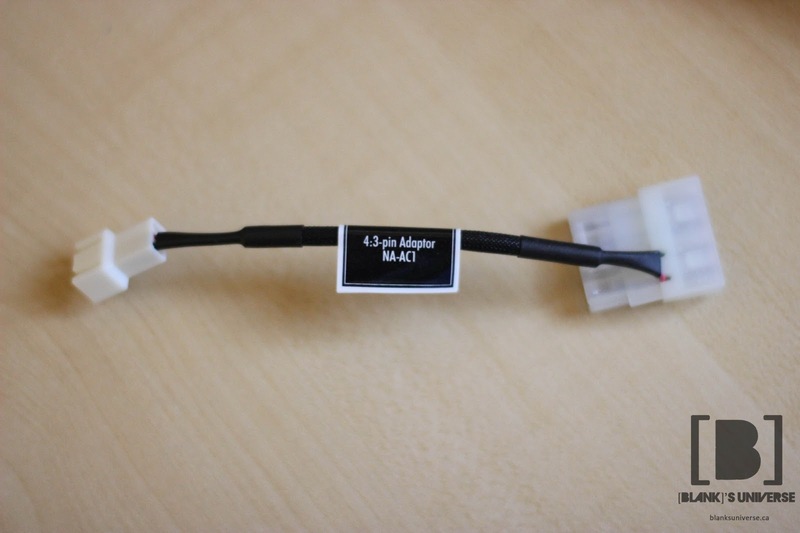 The heat shrink also reaches the end of the connectors so little to none of the actual coloured cables are showing. 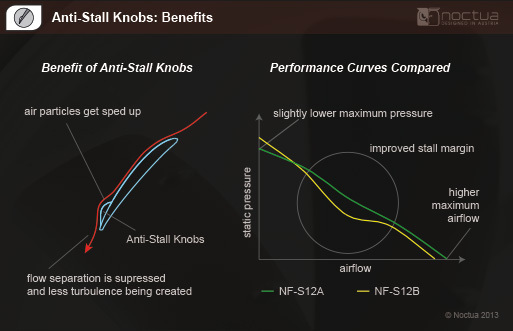 The trailing edge of the fan blades feature Noctua's Anti-Stall knobs which decrease air stalling at the edge of the blades when there is a low flow of air moving over it due to air impedance from fan filters or radiators. The low airflow causes flow separation near the edge of the fan blade, reducing its performance. The bumps located on the trailing edge speed up the air moving over it to reduce flow separation. This works because the air particles on the top of the wing have to move over a larger surface compared to the particles on the bottom, but have to to reach the end at the same time, resulting in faster moving particles on top. The frame of the NF-S12A is extremely solid and has little to no flex. 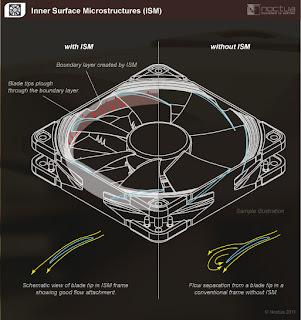 The Advanced Acoustic Optimization (AAO) frames are a combination of Noctua's silence optimized designs, which include the integrated anti-vibration pads, as well as their Stepped Inlet Design and Inner Surface Microstructures (ISM). 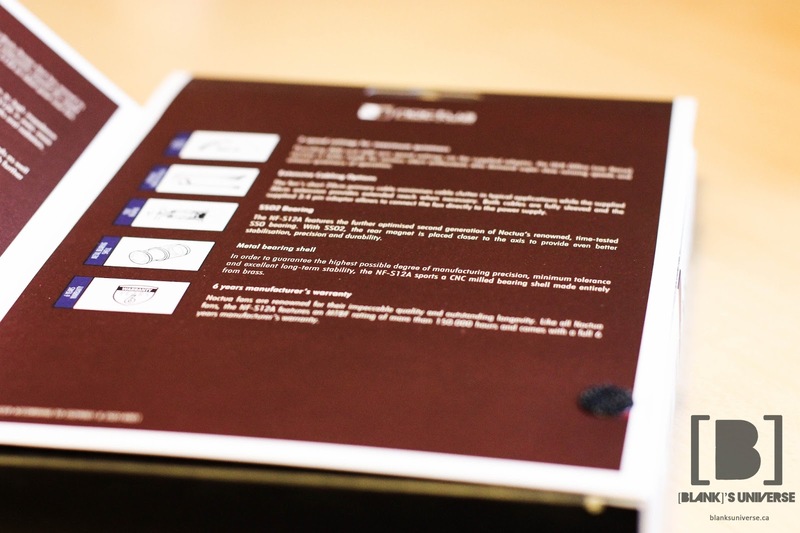 The integrated anti-vibration pads work in conjunction with the included anti-vibration mounts to prevent vibrations from the fan transferring onto the case and increasing fan noise. 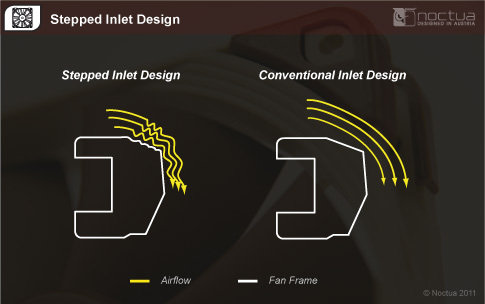 Noctua's Stepped Inlet Design is an aerodynamic design that adds turbulence to the air flowing over the edge of the frame, helping with the transition from a laminar flow to a turbulent flow. 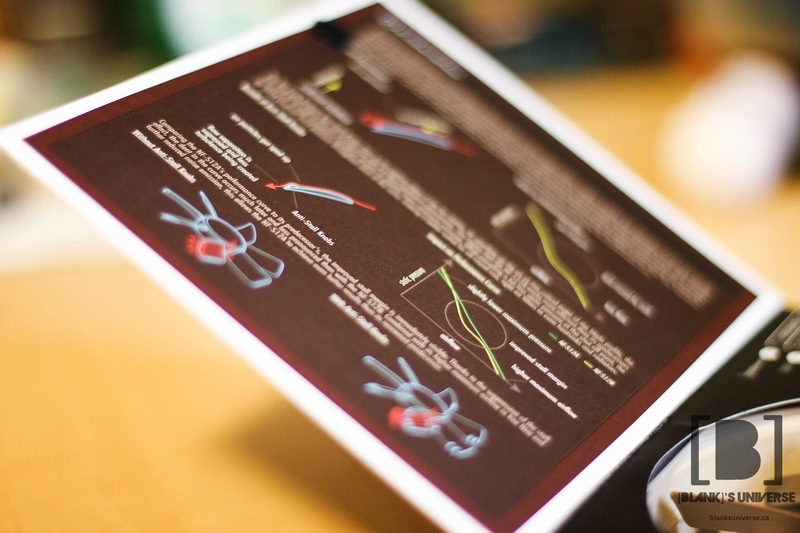 This helps the air stay closer to the edge of the frame, similar to how the dimples of a golf ball work, improving the flow of air going over it. Better flow attachment to the frame will help the fan blades draw in more air, improving the airflow efficiency. The Inner Surface Microstructures are small dents located on the inner edge of the frame that create a turbulent boundary layer in which the fans can pass by. 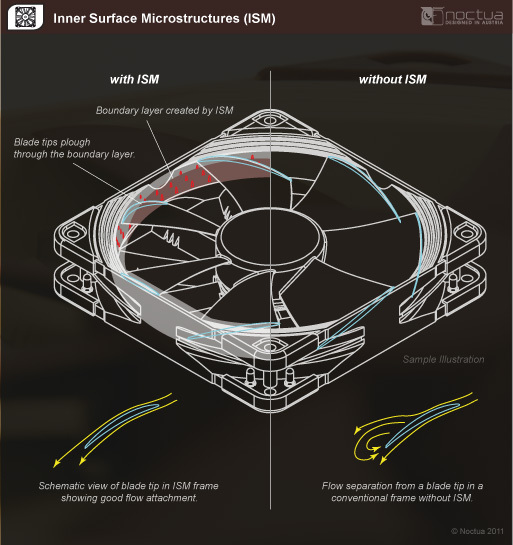 When the fan blades plough through this boundary layer, the flow separation is slightly reduced, helping improve airflow performance as well as lowering the noise output of the fans. 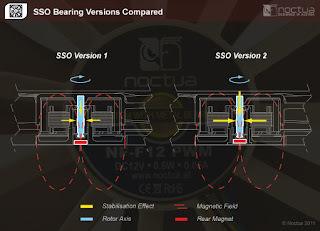 The NF-S12As also feature Noctua's Self-Stabilizing Oil [second generation] (SSO2) bearings, which are an improvement over the previous generation SSO bearings and are also found in all of their award-winning premium fans. The SSO bearings combine oil-based hydrodynamic bearings with an additional magnet that helps support the self-stabilization of the rotor axis. 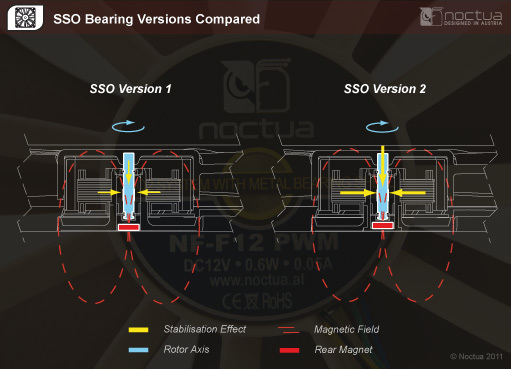 With the additional magnet, Noctua's SSO bearings achieve a higher precision while maintaining an enhanced longevity compared to conventional ball, sleeve, or hydrodynamic bearings. The Metal Bearing shell featured in the NF-S12A is used to achieve the highest degree of manufacturing precision with tighter tolerances, providing better long-term stability. The bearings found on the newest 120mm and 140mm fans are Computer Numerical Control (CNC) milled entirely out of brass. Fans are mounted in a push/pull configuration with a fixed RPM. IntelBurnTest V2.54 is used to put the CPU under load and is run 10 times. Temperatures are recorded in degrees C using CoreTemp with an ambient temperature of 20 degrees C.
Fans are tested using the integrated Corsair fan controller. 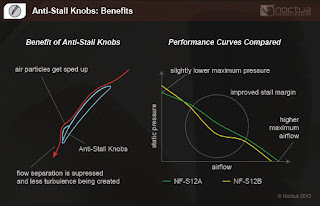 The NF-S12As set up in a push-pull configuration at 1200RPM with the FLX and PWM fans did marginally better than the stock Corsair fans that came with the H80 running at 1500RPM. The Corsair fan can run at 2500RPM and improves performance significantly but the noise output was too high to be considered usable in normal situations without being bothersome. Temperatures at idle were extremely close and temperatures under load were close as well. 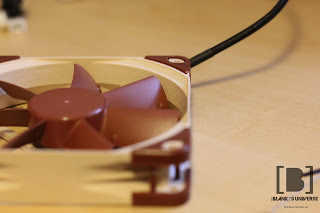 The Noctua fans were significantly quieter while running at a higher speed than fans such as the BitFenix Spectre and Fractal Silent series fans. It should also be noted that the Corsair fans are pressure optimized and designed for use with radiators while the Noctua NF-S12As were designed for case ventilation or situations with low air impedance. 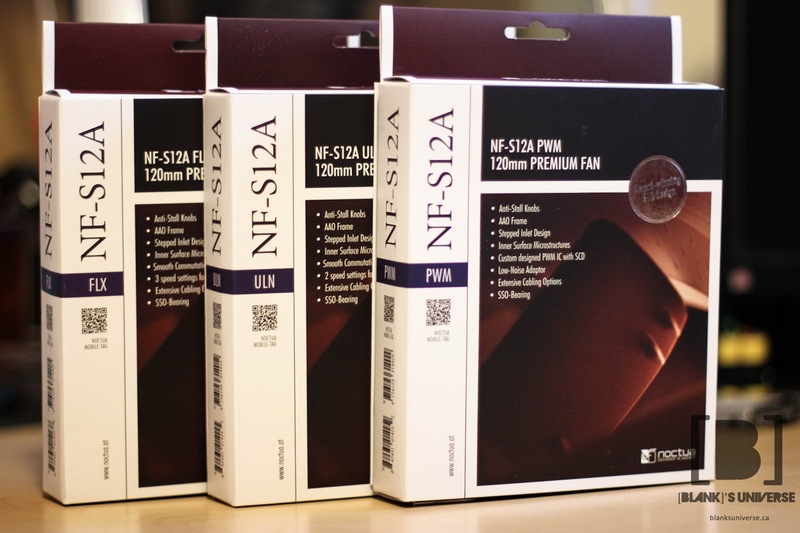 The Noctua NF-S12A fans are $22.99 at our local NCIX retailer and they sit in the pricier part of the spectrum. They provide the premium feel and performance you should expect for such an expensive product. 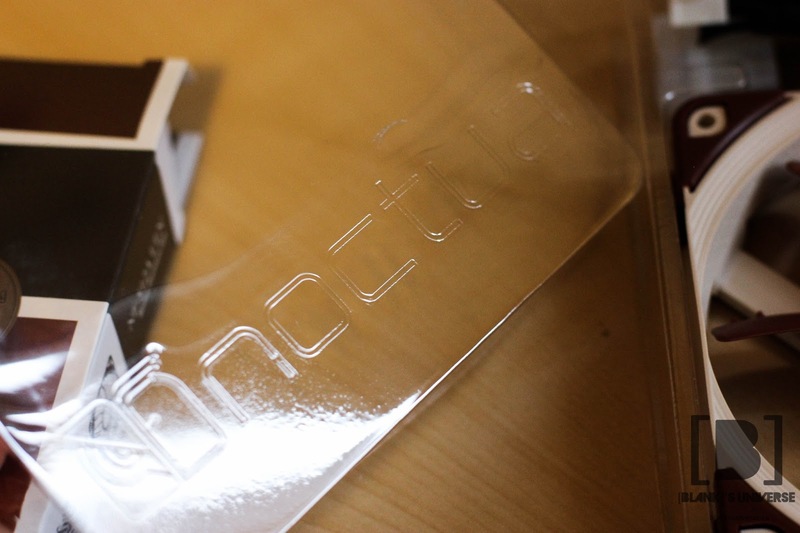 Noctua has incorporated many enhancements and features into the fan, right down to the sticker in the middle, which isn't a sticker at all, but a metal badge. 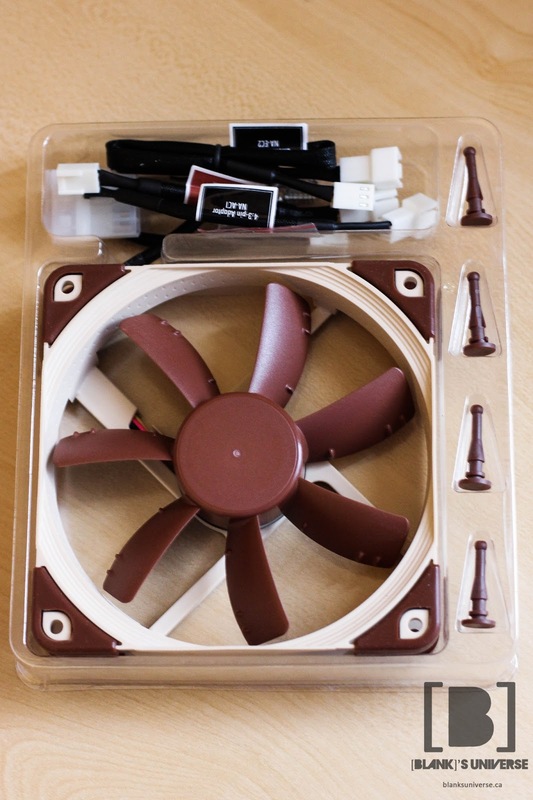 There is a lot of detail put into manufacturing a Noctua fan and it shows in its performance. 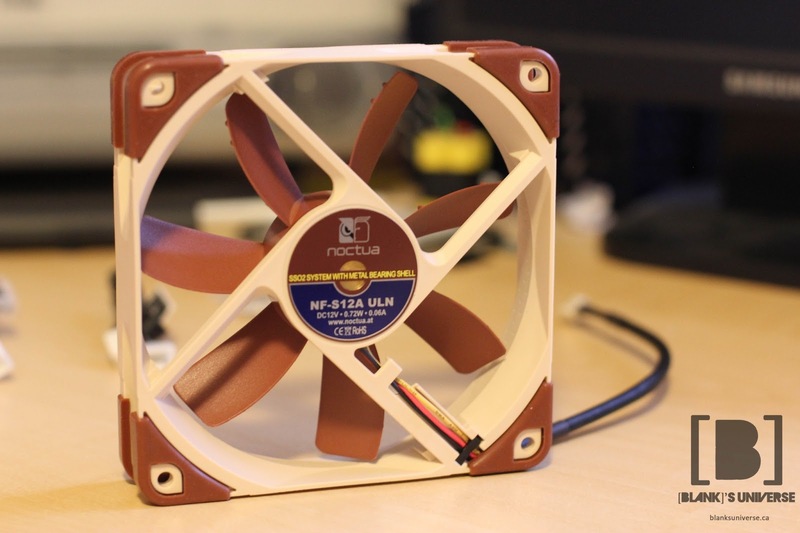 Noctua backs up their fans with a 6-year warranty, showing that they are designed to last a very long time. 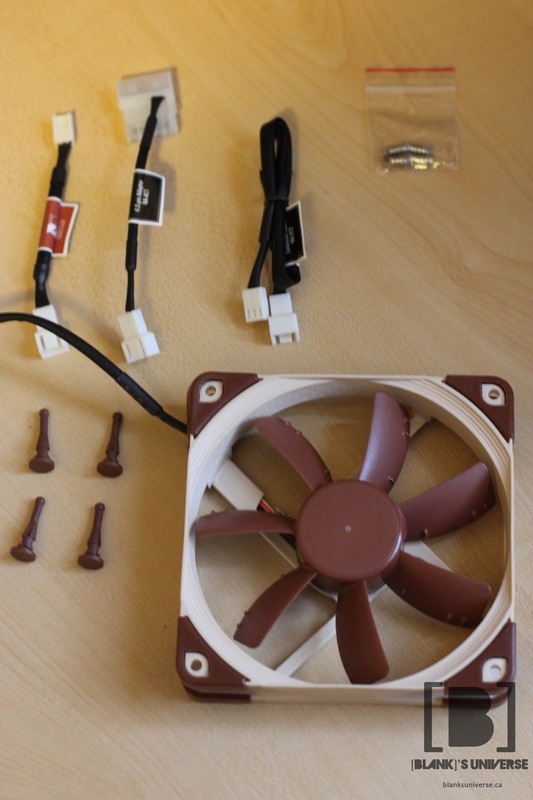 Noctua has clearly put years of development onto these fans, which sets them apart from many other fan manufacturers. Many people complain about the high price, but I feel that the price is justified considering all the money spent on technology and research that was put into these fans. There are very few things that I dislike about this fan. The only thing that may bother some people would be the colour scheme, which I don't personally mind. Noctua fans would be my first choice when selecting a fan for my computer if I could overlook price. They provide amazing performance and ultra low noise compared to many other fans. 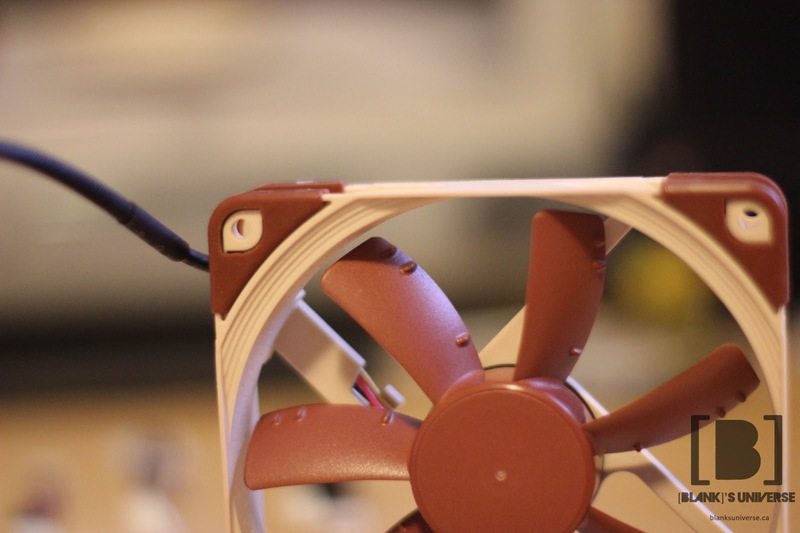 Once again, a big thanks to Noctua for providing the fans for review!